Albert Wat, senior policy analyst at the National Governors Association Center for Best Practices, helped set the stage for the day’s conference, Birth Through Grade 3 Policy Forum: Developing Strategic Pathways to College and Career Success. 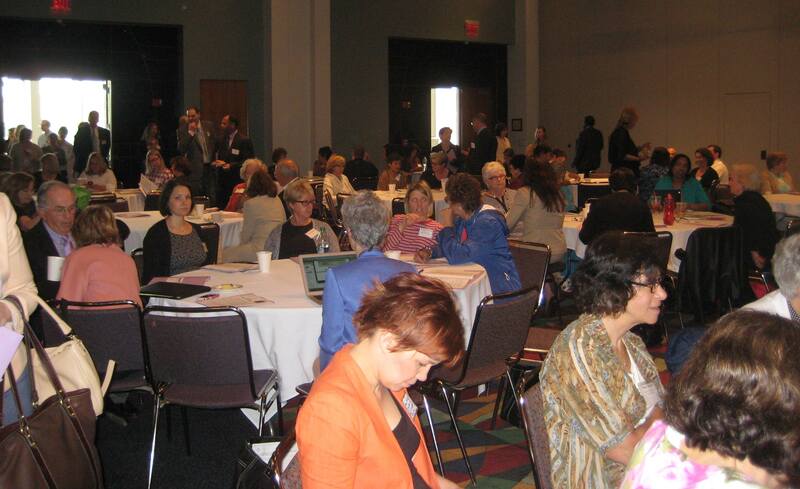 More than 250 early educators, K-12 administrators, and community leaders gathered at the DCU center on Friday, May 16, to discuss birth-grade three policy strategies at the local and state levels. Community-wide efforts, collaboration, and shared accountability were among the prominent themes of the day. The event was sponsored by the Department of Early Education and Care, the Department of Elementary and Secondary Education, the Department of Higher Education, the Readiness Centers Network, and Strategies for Children. A team of representatives from these agencies have been working collaboratively on a shared B-8 agenda since Massachusetts was awarded a grant from the National Governors Association Center for Best Practices (NGA) back in June, 2013. Five other states received similar NGA policy academy grants. Saeyun Lee, senior assistant commissioner at the Massachusetts Department of Higher Education, told attendees, “This event is the result of months of analysis from the NGA team. Today, you will be able to contribute to the state’s birth-grade 3 agenda.” Even though the NGA grant ends in four to five months, the work will be ongoing. Department of Elementary and Secondary Education Commissioner Mitchell Chester was particularly enthusiastic about the shared vision of the three commissioners, and highlighted new opportunities in the state budget to expand pre-kindergarten. Commissioner Chester was also cautious about rigidly holding young children to artificial standards. “Even the question of ‘readiness’ can lead us astray,” said Chester. “I’ve never met a young person who isn’t ready to learn. The question is, are we ready for them?” which drew a standing ovation from the crowd. Smith sees community-wide efforts as part of the solution to grade-level reading. “We’ve got to recruit the energy of communities,” said Smith, noting that the work of the Campaign in communities across the country has been greatly informed by the communities in Massachusetts, including Springfield, Holyoke, and Pittsfield among others. Smith closed by reminding the audience that reading proficiency creates a sense of agency in children, and helps them become architects of their own destiny. L-R, Saeyun Lee, Commissioner Tom Weber, Supt. Sergio Páez, Mayor Alex Morse, Kristine Hazzard, Dexter Johnson, Amy O’Leary, Jason Sachs. Photo by Chau Ly courtesy of the Department of Early Education and Care. Next, Early Education for All Campaign Director Amy O’Leary moderated a panel of local leaders discussing the effective practices they have discovered while engaging in local alignment work. Panelists included Kristine Hazzard, President and Chief Executive Officer of the Berkshire United Way; Dexter Johnson, Senior Vice President of Operations and Education for the YMCA of Greater Springfield; Alex Morse, Mayor of the City of Holyoke; Sergio Páez, Superintendent of the Holyoke Public Schools; and Jason Sachs, Director of Early Childhood Education for the Boston Public Schools. Panelists remarked how their early literacy campaigns and collaborations grew organically over time and have been reinforced by committed leaders and a sense of shared responsibility. “I’ve seen collaborations that are self-serving. This one is self-less. People don’t ‘check-out’ if there’s no immediate benefit for them or their program,” said Dexter Johnson of the community work in Springfield. Providing comprehensive support services for children and families. Think about infrastructure for adult capacity. Even though birth – grade 3 efforts are all about the children, to do this work well, sometimes it is all about the adults, their skills, supports, and ongoing professional development. Think about who is missing from your local effort. Who has a stake? Who has a role in the solution? Develop shared language and coherence among diverse stakeholders. Have families engaged as community partners. What is the role of families as community leaders? Plan for sustainability. The work should continue past any one grant, so plan ahead and have those discussions. Ralph Smith gave a passionate and motivating speech on reducing the achievement gap.